Water damage restoration is something people don’t realize they need until a major water disaster happens. When a pipe bursts open or floodwater slowly rises, people panic and try to stop the flow of the water. Then they will contact a water damage repair company like Southeast Restoration in Augusta. But, water damage restoration companies should be called for minor water emergencies like slow pipe leaks and ceiling leaks. People do not often think about how damaging small leaks can be, but this type of water damage is the kind that will deteriorate your home. Oftentimes, it is hard to tell that water damage is happening. Water that escapes pipes inside walls and in spaces of homes that are not visited often is left unattended and causes structural damage and mold growth. By the time the water is detected, the damage has already been done. That is why it is important to understand where water damage happens and how to recognize signs of water damage. Water damage can happen anywhere in a house, but there are spaces that see damage more often. Attics – Attics are not entered often and are closest to the roof. Ceiling leaks and unsealed windows go unnoticed because an attic is not a commonly visited area of the home. Basements – Again, another less visited area of the home. Basements are common flood spaces due to unsealed windows, broken pipes under the foundation, and sump pump backups. Water heaters are often found in the basement as well and if a water heater malfunctions, it can cause serious water damage. Ceilings – Ceilings get worn out over time. Sometimes ceilings are damaged from storms are snow/ice build up on the roof. 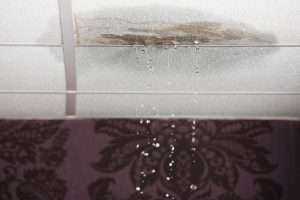 When the integrity of the roof is compromised, water can get through the ceiling. Bathrooms – For obvious reasons, the bathroom is a common place to find water damage. Bathtubs and toilets overflow. Pipes under the sink and in the toilet plumbing can break. The bathroom is a major contributor to water damage. Discoloration – Ceilings and walls will develop spots and stains when water is affecting them. They may appear yellow or brownish and the paint or wallpaper will start bubbling, cracking, or peeling away. Texture Changes – Warping and buckling will happen when water has affected areas of a home. Edges will curl and wood will expand or tent upward. Sometimes the area will feel spongy if the water damage has infiltrated the area enough. Odor – Wherever there is water damage, there is a mold problem. And mold has a scent that is not easily missed. If an area of your home smells musty and moldy, you can guarantee that there is a water problem present. If you suspect water damage in your Augusta home, be sure to contact the professional water damage repair team at Southeast Restoration. Our professional team is certified and insured to clean and restore water damage and mold damage. Call us for 24/7 emergency help.